This series of entries are game play notes about Unity of Command, which I will review in the following days. They are written as an AAR with frequent stops along the way to showcase the game's features and design. 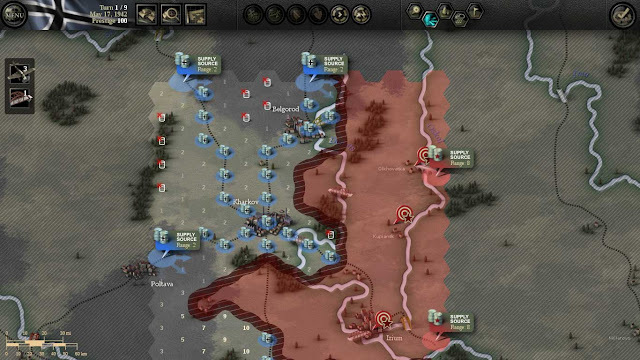 This war game features both single scenarios and a campaign which is more or less a series of scenarios linked together. 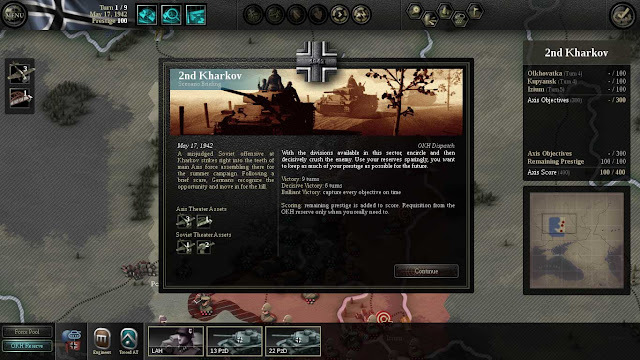 For this series I choose the 2nd Kharkov scenario and I am playing as the Germans (single scenarios can be played from one pre-determined side, not both). 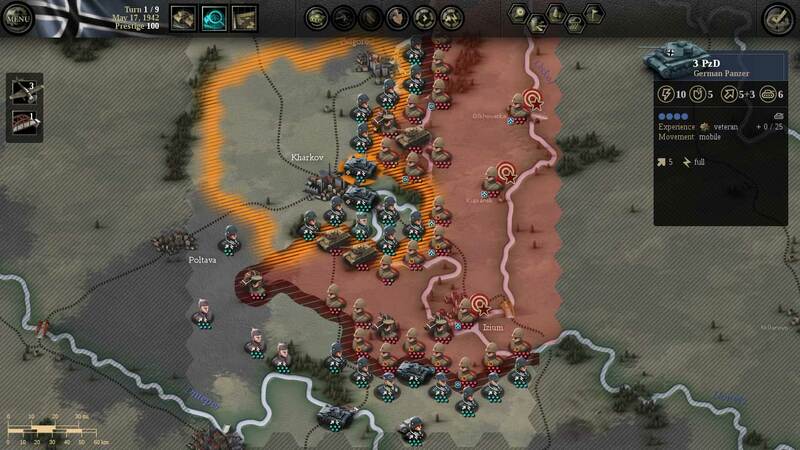 Unity of Command (UoC from here on) is a war game where the player makes decisions at the operational level of war. Unit sizes are divisions for the Germans (with the occasional regiment here and there) and Corps/Armies for the Soviets. The game engine revolves around hexes and turns: one hexagon equals 20 km and one turn spans 4 days of simulated operations. Mission objectives for the scenario are brought up by clicking the hexagon shaped button on the right upper corner of the screen. As seen above, the victory points are calculated based on the time the player takes to seize the objectives. I'm pretty much ignoring that feature and rather focusing in taking the objectives by the end of the scenario, but I wonder how much of these time restrictions will prompt a more conscious player into dumping a militarily sound operations plan just because the game's clock is ticking. Before we move into other considerations, I would like to point out the size of the seemingly limited geographic area where this scenario plays. 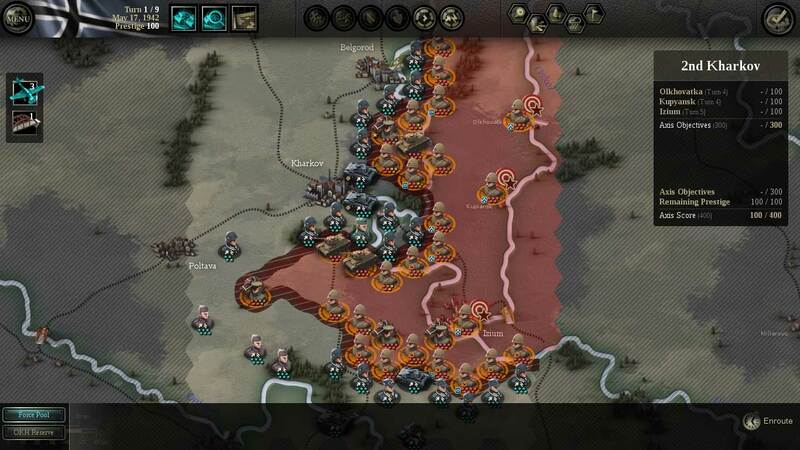 Most of the scenarios will feature areas of operations that can be seen on a single screen or one full scroll at most. There is no zoom in or zoom out. Keep in mind that with every hex representing 20 km of terrain, what you see in the above screenshot is a front of some 280 km. To even start thinking about the operations, it is indispensable to pay attention to the supply situation. Units out of supply will start deteriorating in their war waging capabilities: recovery of combat power (one turn without supply), ability to conduct offensive operations and to use all of their assets in defensive combat (two turns without supply) and ability to move (three turns without supply). The supplies in UoC are moved through the area of operations from supply sources that can spread the goods to varying distances. To see the supply network, the player has to click another hex-shaped button in the upper right corner. The distances that supplies can reach are automatically calculated by the engine. The movement of supplies is calculated by movement tables. 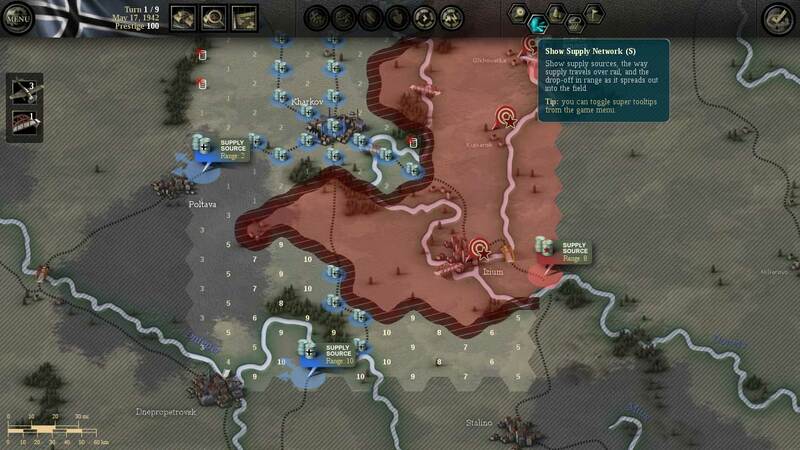 For example, the screenshot above shows that the two supplies at the north of the area of operations can move supplies to a range of 2 movement points. Note how the area northwest of Belgorod is out of supply (white barrel icons crossed by a red x). This is because the supplies coming out of the mentioned supply sources do not have enough movement points to move supplies to those hexes. The numbers shown inside the hexes do not indicate the amount of supplies available at that hex, they are just an indicator of the movement points left to supplies moving through the hex (i.e. hexes are either in or out of supply in a boolean way). There is no distinction between different types of supplies (fuel, ammo, parts and food). No bean counting in this game. In the above supply map, the enemy-held area is shaded red and off course this whole area is out of supply for the Germans. Movement of supplies through the railroad network is free (i.e. no movement costs). A visual indication of such a crucial feature is displayed by smaller barrel icons, which act as mini-supply sources themselves. The railroad network (displayed as dotted lines) is thus a vital consideration for planning an operation. Let's take a look at the supply situation in the south part of the area of operations. The supply source in the south has a range of 10. That's the good news. The bad news is that the supply source is behind a river and that the rail line coming out of it is just five short hexes long. If the Soviets occupy any of those rail road hexes, the supply situation east and west of the rail line will be catastrophic. And believe me, when it comes to cutting you off from your supply sources, the computer opponent will go for the jugular. Let's take a quick look at one of the formations available. Selection of units is done by clicking the respective icon. The unit I selected is the 3rd PzD. The unit's details are shown in a separate window at the top right corner. The units attributes are strength (featured in abstracted steps, the 4 blue dots), attack, defense, armor (10, 5 and 6 respectively) and movement (5 +3). The limits of the hexes where a unit can move given their movement allowance of a unit are shown by an orange shadowing. The 3rd PzD. can move anywhere inside the orange area (5 movement points) and still perform an offensive operation after the move. For this unit, there is also another 3 movement points available for extended move. The hexes that are reachable after an extended move are shown with a grey shadowing (see below). The extended move mode is activated by spinning the mouse wheel. 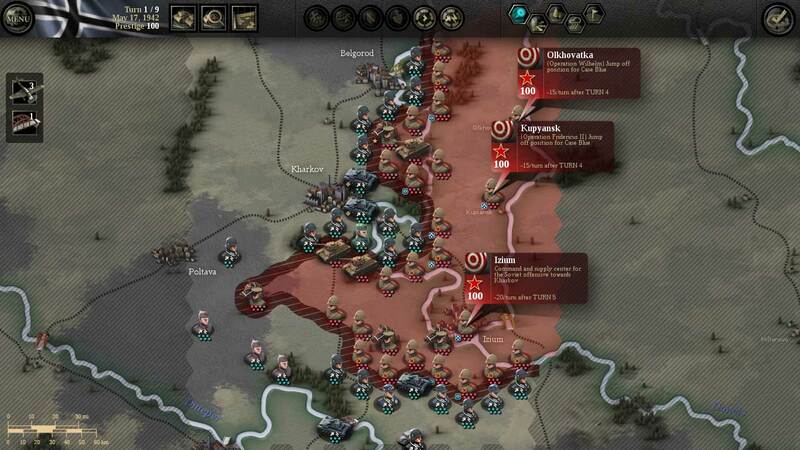 After an extended move, a unit can't perform any offensive operations. There are three types of theater-wide resources available to the player: (i) high command reserves or reinforcements, (ii) air operations and (iii) bridge operations. 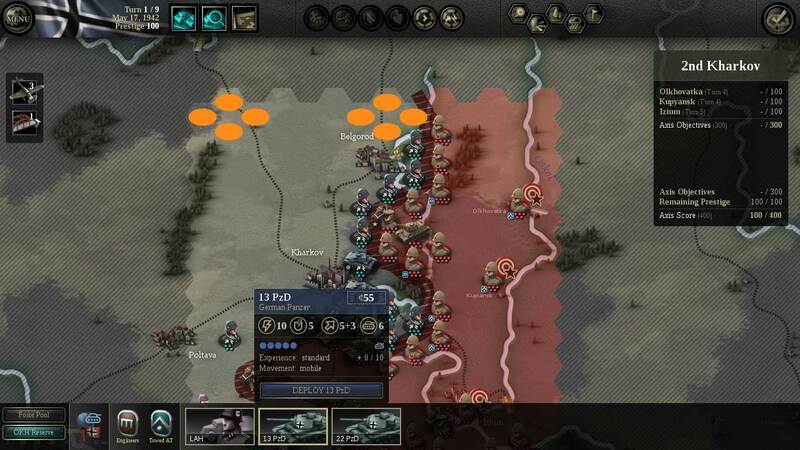 High command reserves and reinforcements are accessed through a button to the left in the upper portion of the screen. There are a variety of combat support assets and entire combat formations. In this case, as the German player I can get combat engineer and anti-tank assets added to any of the units already deployed. These combat support assets add to the combat strength of the unit. I can also get three combat units: a motorized SS division, the 13th and the 22nd PzD (see bottom of the screenshot above). In this case, if I choose to deploy the 13th PzD, the available deployment areas are shaded in orange. The delivery of these reserves from the high command comes at a price. Every time you tap into the high command reserves, you are deducted "prestige" points which expenditure impacts your overall score in the victory calculation. In the screenshot above, the deployment of the 13th PzD costs me 55 prestige points. You start with a limited amount of prestige points, so watch for those. The number of air operations available at each turn is fixed. In this case, 3 major air operations only. The interface for using those air operations is very simple: just click the button in the left of the screen and all the targets available will be highlighted in orange. In this scenario there is 1 bridge operation available per turn. Bridge operations are build or destroy. Clicking the bridge icon on the left will show the player the places where bridges can be built (highlighted blue) or destroyed (highlighted orange). Obviously, having bridges available for an operation is a good thing: units crossing a bridge do not expend any movement points and can attack right away after the crossing. But don't be discouraged by the few bridges available in the area of operations. Any unit can cross a river through a point where there is not a major bridge. This kind of simulates minor river operations performed by combat formations. However, when a crossing is performed not through a major bridge, the unit losses its ability to perform extended moves (the ones highlighted in grey, see above). That ends my short introduction to the game mechanics. Coming up next, an operations plan. Middle-click also works fine for opening pics in a new tab. Also, interesting AAR. Looking forward to getting to know this game a little bit better. Strength and Unity are necessary to fight against Obstacles because unity mean together and strength mean power. How to attain Strength and Unity know secret methods form satancantstandme this is strong group of people that help to everyone.